Londoner Tom Donhou reached the speed of 80 miles-per-hour on his homemade bike and came close to breaking the record cycling speed set by Fred Rompelberg back in 1995. Donhou pedaled behind his Ford Zephyr Mk 3, using it as wind protection, and managed to hit 60mph on his first run, before later improving his speed. 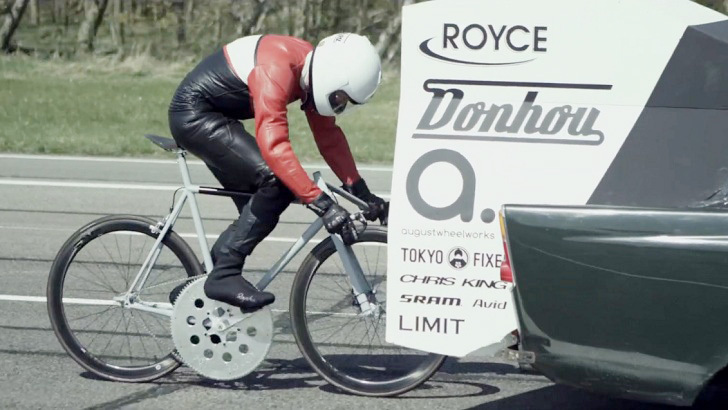 Inspired by salt flat racing and especially motor-paced bicycle racing, in which a rider follows a car’s slipstream to achieve higher speed, Donhou decided to test how fast could he go riding a bike made in his own workshop, following his old Ford Zephyr. While he didn’t come particularly close to reaching Fred Rompelberg’s 1995 record of 167.044 miles per hour, Donhou did reach some dizzying speeds. Initially he hit 80 miles-per-hour, and later, because of the car’s speed limitation Donhou later tested the speed of his bike on rollers and managed to reach the 102 mile-per-hour mark. Donhou spends most of his time building custom bicycles in a small workshop in the U.K. When talking about his work he stresses the fact that both bike and car parts, chronologically often decades apart, are part of a long tradition of British-manufacturing. How many teeth is that chainring?